This seems to be shaping up as the year of the "Sunrise." Two outstanding sets by that name have been released in 2012: one by the Masabumi Kikuchi Trio on ECM Records, the other a self-produced gem by the Indo/American chamber ensemble, Karavika. 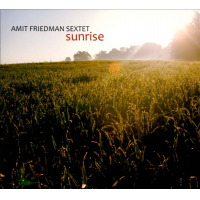 Israeli saxophonist Amit Friedman makes it a triptych with his own Sunrise, on Seattle's Origin Records. 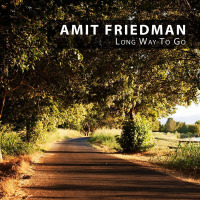 Friedman has a knack for memorable melodies enmeshed in sophisticated and lively arrangements. On the title tune (which opens the set), the day begins on the gentle notes of string bass and oud. Friedman joins them on soprano sax, the sky lightening gradually on the horizon. The tempo gathers intensity, the sun sliding up over the chimney tops. Stringsviolin, viola and cello are featured on half the tunes heresweeten the morning air while bubbling percussion lends a world music tint to the dawn. "Or" begins as a ruminative ballad with a Middle-Eastern tint. But at the two minute mark, the tune undergoes a gear shift into a bluesy, hard blowing, 1960s Blue Note Records groove, Friedman going with a muscular delivery on the tenor sax. "Bolero" is the most beautiful and sultry of these Friedman originalsa tranquil, floating-on-air tune riding a fluid rhythm. "Tales of Hoffman (for Amos)" follows with frantic momentum, featuring a searing saxophone and Omri Mor's sparklingly percussive piano work. "La Refarela" has an ebullient, south of the (American) border mood. Friedman and his sextet are adept mixers of styles. "Optimism (for Sonny Rollins)," features a danceable calypso rhythm and Freidman's straight-at-you, powerhouse tenor work that is very much in the Rollins mode; "You Must Go" has a classical sheen with the strings back in the mix. A second version of the title tune closes the set. Tamar Eisenman guests with a soft-tufted, every woman vocal that contrasts beautifully with Friedman's short-but-sweet solo on soprano saxophone, bringing the music full circle, from sunrise to sunrise. Track Listing: Sunrise; Or; Ups & Downs Interlude; Ups & Downs; Bolero; The Tales of Hoffman; La Refarela; The Archeologist Interlude; The Archeologist; Optimism (for Sonny Rollins); You Must Go; Sunrise.